Disclosure: This is a compensated campaign in collaboration with Success® Rice and BlogHer. 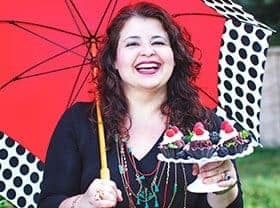 Thank you, friends, for supporting the brands that I work with and love! Running out of ideas for quick yet wholesome weeknight dinner meals? No worries… we’ve got you covered! 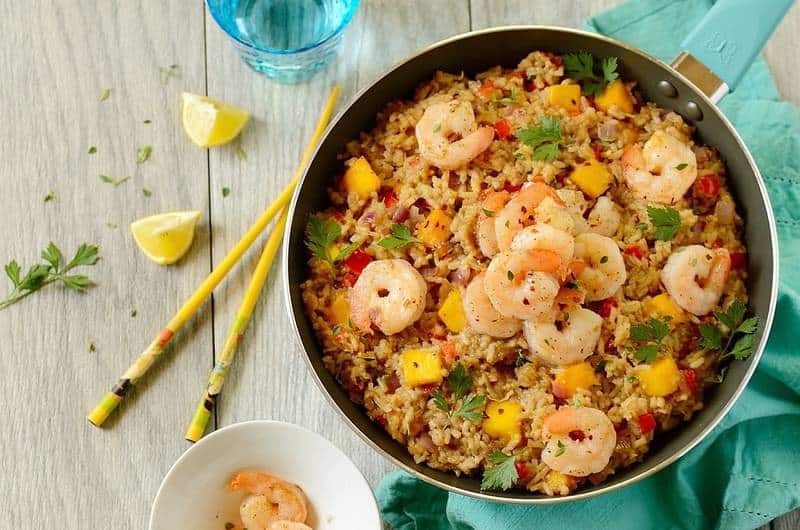 This easy Shrimp Coconut Fried Rice with simple ingredients can be prepared within 30 minutes, making the perfect dish for those busy days. Yes, it is happiness in a pan! 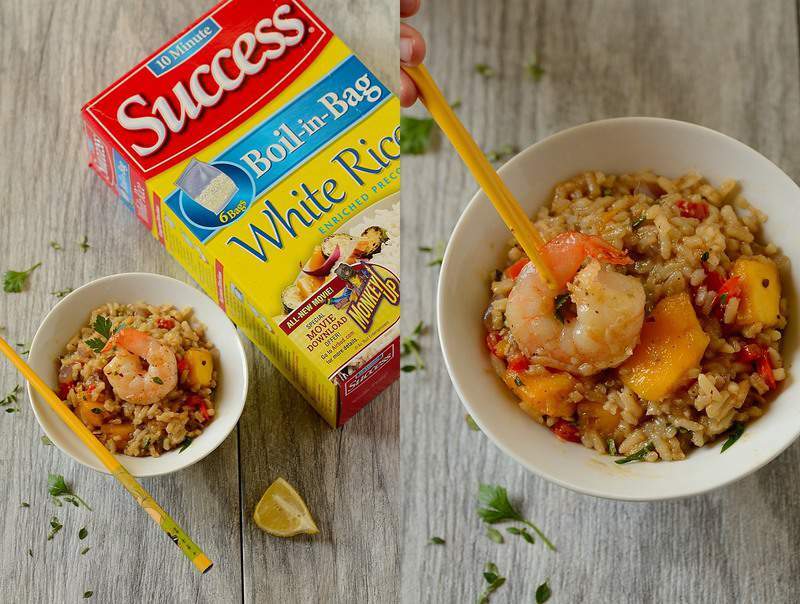 Success® Rice is available in 4 varieties: Success® Whole Grain Brown Rice, Success® White Rice, and globally inspired aromatic varieties of Success® Rice, including fragrant Thai Jasmine and Basmati Rice. As you can see, there is a variety that everyone in your family will love! Each of them is convenient, and can be made on the stove or in the microwave without sacrificing great taste or quality. 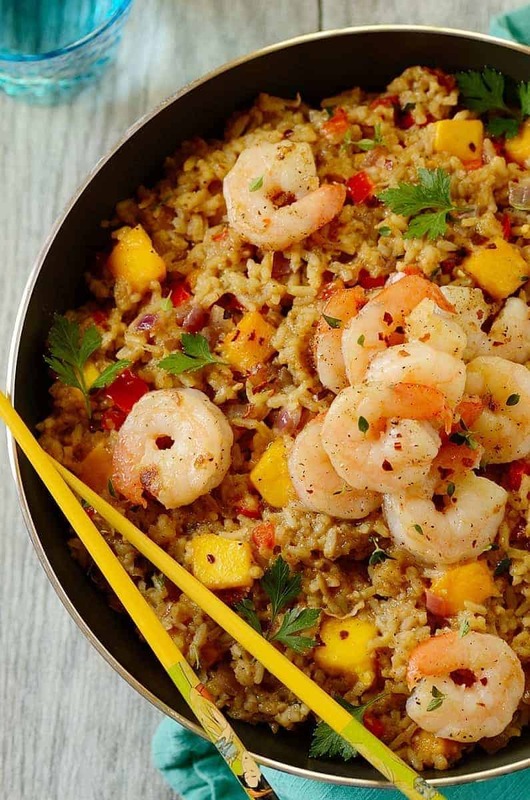 It’s a great pantry staple that can be used to make a variety of meals – for breakfast, lunch or dinner… as well as to prepare this shrimp coconut fried rice. All of these varieties are conveniently packaged in pre-measured colander-style bags — and contain no additives or preservatives. They are available at grocery retailers nationwide and have an average retail price of $2.45 for 14 oz., making them accessible and affordable for our families. But that’s not all! You can count on hundreds of other delicious and easy recipe ideas — as well as special offers and more: just join the Riceipe Club® here. For more info, check out the official brand website. You can also visit their Facebook, Twitter, Pinterest, and Instagram. What’s your favorite dish to cook with your preferred variety of rice? For now, enjoy our colorful and yummy shrimp coconut fried rice. OUR GIVEAWAY WINNER WAS MAMI2JCN. CONGRATULATIONS!!! 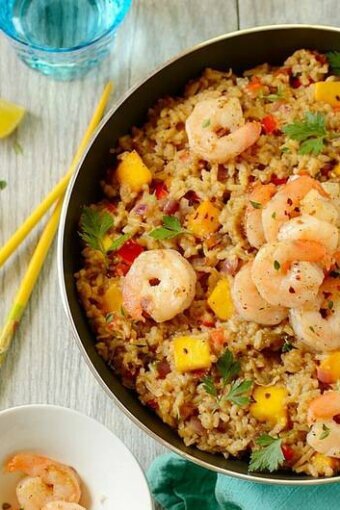 An Easy Shrimp Coconut Fried Rice made with shrimp, white rice, vegetables, coconut oil, and mango that can be prepared within 30 minutes. It makes the perfect weeknight dinner! Cook the rice according to the instructions in the package, about 8-10 minutes. While rice is cooking, cook the other ingredients. Start by whisking together soy sauce, ginger powder, and black pepper in a small bowl; set aside. In a large skillet or wok, heat both the coconut oil and vegetable or peanut oil over medium heat. Add shrimp and cook, stirring occasionally, for about 3-4 minutes or just until turning pink; season with salt and pepper to taste and place on a plate or in a bowl using a slotted spoon. Add the onion and bell pepper to the skillet, and cook over medium-low to medium heat, stirring often, until vegetables have softened, about 3 minutes. Stir in the coconut flakes and then the cubes of mango and cook, stirring constantly, for about 2 minutes. Stir in the reserved soy sauce mixture and let heat for about 1 minute. Then add the rice and cook, stirring constantly, for about 2 minutes or until heated through. Stir in the cooked shrimp and adjust the salt and pepper to taste. Stir in the cilantro/parsley. Serve the shrimp coconut fried rice immediately. I like to make just plain rice to go with chili. I love to make my Chicken Fried Rice recipe in a wok. My family just loves it! 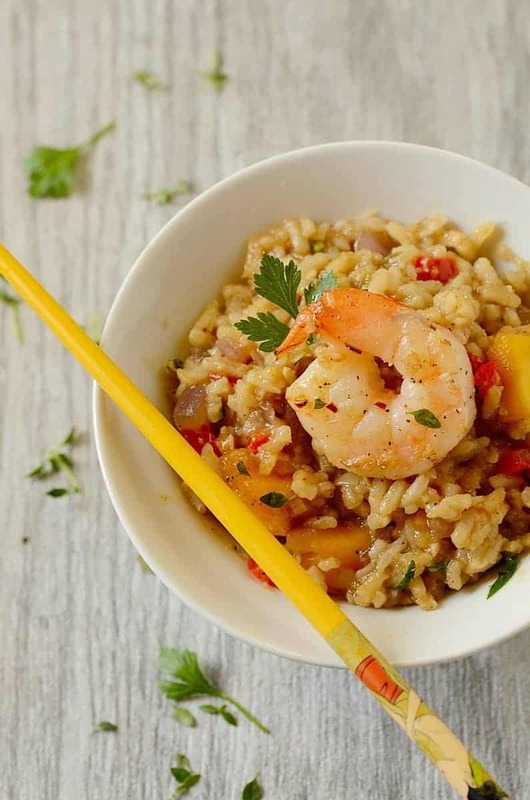 Your Shrimp Coconut Fried rice looks amazing! I want to make it. This is a great recipe, as you say, something quick and tasty when you need it! Shame I’m not in the US to enter! My preferred variety of rice is Jasmine rice and then I LOVE to make Chicken Tikka Masala with it in the crockpot. Delicious!! Oh wow, fast and fabulous, that’s how to get dinner done! My favorite way to make rice is paella. That is when I’ve got time to spend in the kitchen! For a regular week night dinner I also make fried rice. It is a great way to use up leftover meats and vegetables. I always add soy and fish sauce right before serving. My favorite dish is General Tso’s with white rice. My favorite dish to cook is stir fry with Success rice it is so fast and healthy. I like plain rice in a chicken and rice casserole. I made pork cubed steak & gravy, success rice, & baby green limas. I love to use yellow Spanish rice to make arroz con pollo. I like to make rice balls with white rice. I like to make brown rice with stir fried veggies. I love making Spanish rice with chicken. My family loves it. Good dish! And thanks to the intro to the rice — I normally just buy big bags of the stuff, and didn’t even know this product existed. Thanks! I love to use white rice to make a chicken broccoli and mushroom stir fry. I like making sweet and sour pork on top of brown rice. Thanks so much. I love to cook GYUDON with short-grain or medium-grain white rice. I love to cook the brown rice with some form of baked chicken, usually the lemon-pepper chicken breast! My favorite rice dish is Cashew Raisin Rice Pilaf. 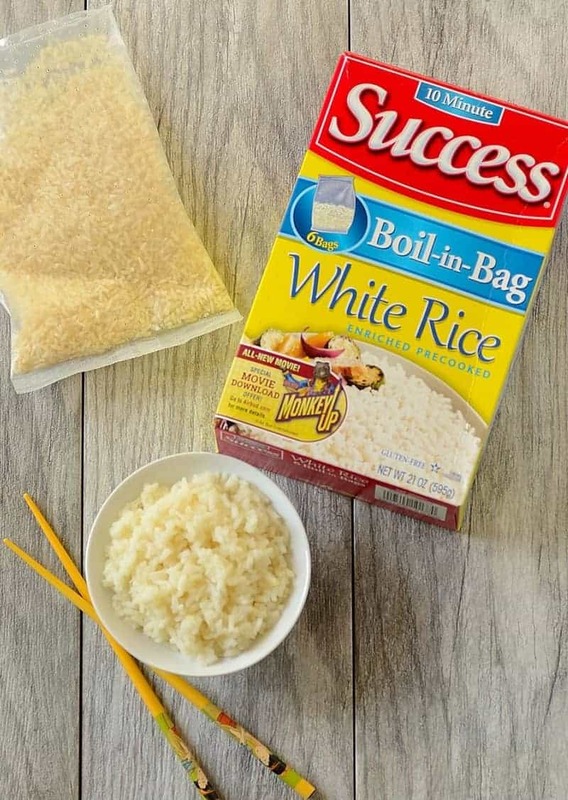 I always have a couple of boxes of Success in my pantry…I like their brown rice as well. What is nice is that it doesn’t take near as long to cook as regular brown rice. Your dish sounds very tropical, perfect for summer. My favorite dish to cook is shrimp fried rice. easy and delicious. But I need to try your recipe. sounds amazing! My favorite meal to serve with brown rice is pork carnitas burritos. I like adding roasted peppers, onions and corn along with a spicy salsa and spinach. I posted a tweet: https://twitter.com/FireRunner2379/status/759525065243394048. I usually just make pretty simple Jasmine rice, but in the brasileiro fashion my mom taught me growing up: toasting the rice with a little onions and garlic before adding the water. Awesome giveaway! I love making chicken curries and putting them over rice! I normally use basmati or brown rice! This is really nice and easy recipe, perfect for a busy week night. I would love to have a bowl of that goodness! Black beans and rice is a family fav. I like chicken and rice soup. I like to use the Jasmine rice and make Beef and Broccoli. I like a shrimp curry recipe over rice. It’s a little spicy which my family loves. I like to make chicken stir fry and mix it with whole grain brown rice. My favorite dish rice dish is General Tso’s with white rice. I like to make fried rice! I *LOVE* Thai pineapple fried rice with shrimp! Cheesy broccoli casserole is my favorite dish! (it uses white rice) I’ve loved it ever since childhood when my mom would make it. My family loves beef tips and gravy over Success white rice. I like to cook Spicy Thai Basil with basmati rice. I like to use original Success rice to make stir fry or fried rice. We make a gumbo with spanish rice. I know, not traditional, but it adds some great flavors! My favorite dish to cook with Fried Rice is Chinese Chicken Fried egg, butter, olive oil, onion, rice, soy sauce, pepper and chicken. Stir fry together for about 5 minutes, then stir in egg.